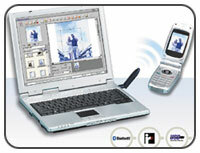 Description: The MA-700 retail package contains a Handset Manager software CD and a quality USB Bluetooth dongle. Bluetooth Data Suite is compatible with bluetooth phones, headsets, and PDAs. It has already reputed for its simple and user-friendly installation and wireless applications, such as MSN Messenger and Skype. Already reputed for its simple and user-friendly installation, Bluetooth Data Suite wirelessly empowers your handset mobile functions by supporting GPRS internet surfing and quality data communication. *GPRS: Support GPRS Mobile Internet Connectivity for the modem-capable phones. Enclosed GSM/GPRS Modem set-up utility is especially designed for mobile phone users to facilitate Wireless Modem installation and Mobile Internet exploration. *User's guide: User manuals and Handset Manager Version 9.0 are available in English, Chinese, German, French, Spanish, Italian, Dutch, Russian, Czech, Greek, Hungarian, Swedish, Polish and Portuguese. Operating systems support : 98SE, ME, 2000, XP. Standards Compliance: Bluetooth V1.1 and USB V1.1 compliant. Regulatory Compliance: FCC Class B, CE Mark, Bluetooth BQB certification. Bluetooth Data Rate: Up to 723Kbps data rate in normal environment. Radio Frequency Output Power: Bluetooth Class 2. Communication Distance: About 10m in normal environment.105 mm x 20 mm x 9 mm. Dimension: 105 mm x 20 mm x 9 mm. Operating Temperature: 0C ~ 40C.